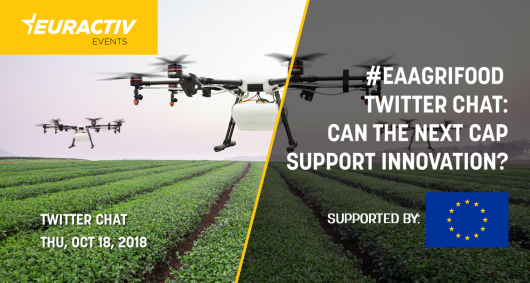 #eaAgriFood Twitter Chat: Can the next CAP support innovation? Increasing global competitiveness, combined with the need to produce more with less via innovation-driven methods, has put pressure on EU policymakers to take immediate action. The EU agricultural sector has taken significant steps the last years to innovate but critics suggest that more should be done in order for Europe to find its feet in the competitive global markets. Recent reports show that the USA, Brazil and China have seen drastic increases in agricultural productivity thanks to the adoption of new technologies, such as plant biotechnology and modern crop protection products. On the other hand, the EU Court has recently ruled that organisms obtained by mutagenesis plant breeding technique are GMOs and should, in principle, fall under the GMO Directive. The ruling shocked the industry, which described it as a severe blow to innovation in EU agriculture and warned about economic and environmental consequences. But environmentalists hailed it as a step in the right direction. At the same time, there is an ongoing debate about the post-2020 Common Agricultural Policy (CAP) and particularly, whether it can help farmers move faster towards the digital era. Q1. How can the new CAP ensure that EU farmers will be granted the proper tools to adopt precision farming practices? Q2. Are the Commission’s proposals sufficient to support innovation in the sector post-2020? Q3. Does innovation only refer to new technologies or is there also another way? Q4. EU Court decision on gene editing: a step back or forward? Q5. How can we make EU agriculture modern and above all, inclusive?